Eleven years ago, I initiated a discussion about the fact that jet fuel fires could not have melted steel at the World Trade Center. The government agency investigating the WTC destruction responded by holding “some of its deliberations in secret.” Although it’s not a secret that jet fuel can’t melt steel, due to propaganda from sources like The Washington Post and The Huffington Post, Americans often get confused about what facts like that mean to any national discussion. In a nutshell, what it means is that the molten metal found at the WTC, for which there is a great deal of evidence, cannot be explained by the official 9/11 myth. No one thinks that jet fuel fires can melt steel beams—not even The Posts’ new science champion, who doesn’t bother to actually use jet fuel or steel beams to teach us about “retarded metallurgical things.” Instead, he uses a thin metal rod and a blacksmith forge to imply that, if the WTC buildings were made of thin metal rods and there were lots of blacksmith forges there, the thin metal rods would have lost strength and this would be the result. If you buy that as an explanation for what happened at the WTC, you might agree that everyone should just stop questioning 9/11. This absurd demonstration highlights at least two major problems with America’s ongoing struggle to understand 9/11. 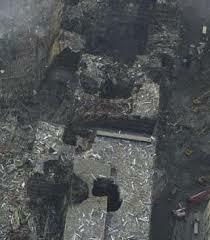 The first is that there was a great deal of molten metal at the WTC. Those who know that fact sometimes share internet memes that say “Jet Fuel Can’t Melt Steel Beams” when they want to convey that “Thermite Melted Steel at the WTC.” The second major problem is that certain mainstream media sources continue to put a lot of energy into dis-informing the public about 9/11. Sources like The Posts, The New York Times and some “alternative media” continue to work hard to support the official myth of 9/11. That effort is not easy because they must do so while providing as little actual information about 9/11 as possible. The dumbing down of the average citizen is a full time job for such propagandists. Luckily for them, American students receive almost no historical context that encourages them to think critically or consider ideas that conflict with blind allegiance to their government. When it comes to the WTC, it also helps that almost 80% of Americans are scientifically illiterate. As media companies attempt to confuse the public about 9/11, they must avoid relating details that might actually get citizens interested in the subject. For example, it’s imperative that they never mention any of these fourteen facts about 9/11. It is also important to never reference certain people, like the ordnance distribution expert (and Iran-Contra suspect) who managed security at the WTC or the tortured top al Qaeda leader who turned out to have nothing to do with al Qaeda. In fact, to support the official myth of 9/11 these days, media must ignore almost every aspect of the crimes while promoting only the most mindless nonsense they can find. Unfortunately, that bewildering strategy becomes more obvious every day. While Americans grieved the 9/11 attacks and U.S. troops went to war in Afghanistan, another army, one made up of ironworkers, heavy equipment operators and mason tenders, toiled day and night to clear away the destruction of the World Trade Center's twin towers in lower Manhattan and recover the bodies of the dead. In just 8 1/2 months, an estimated 1.8 million tons of twisted steel and pulverized concrete were painstakingly removed, transforming a mountainous pile into a 16-acre hole that became known as The Pit. By Memorial Day, it was all but over. The day after the holiday, workers cut down the last column of steel still standing at the site. Another in a series of warships "honoring" 9/11 is christened into action. The third in a series of U.S. Navy amphibious assault vessels named in honor of the victims of the 9/11 terrorist attacks [was] christened Saturday, and a key responder at the Pentagon nearly a decade ago is bringing the heroics of his fellow emergency workers with him. 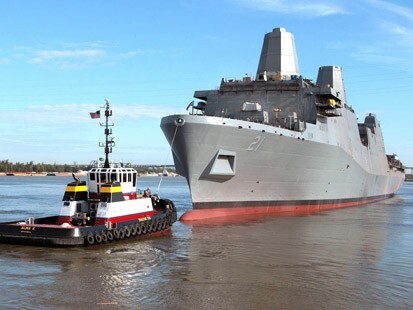 The future USS Arlington is being built at the Northrop Grumman Corp. shipyard in Pascagoula. It's named in honor of Arlington County, Va., where American Airlines Flight 77 crashed into the Pentagon on Sept. 11, 2001, killing 184 people, after being hijacked en route from Washington-Dulles International Airport to Los Angeles. The ship's sponsor is Joyce Rumsfeld, wife of former Secretary of Defense Donald Rumsfeld, who was in the Pentagon on the day of the attack. 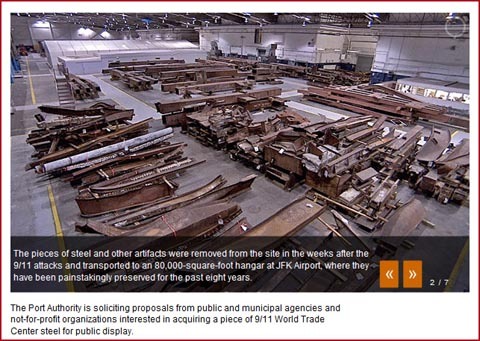 The Port Authority is soliciting proposals from public and municipal agencies and not-for-profit organizations interested in acquiring a piece of 9/11 World Trade Center steel for public display. Design of Bldg 7 -- Texas Engineer, Richard Gage, and Alex Jones on the radio. Texas Engineer calls into the Alex Jones show and discusses with Richard Gage elements of the steel construction of Building 7. Some excellent photos of steel construction are in this short video. Derek, a mechanical engineer familiar with aspects surrounding steel welds, states: "Engineers have an ethical responsibility to protect public health and safety. If we designed building 7 wrong, shouldn't we get many opinions on where we went wrong...so we don't have more buildings falling at freefall speed from office fire?" Naomi Wolf - "There hasen't been a real investigation of 9/11." I know some of you have attacked her for not taking a solid 9/11 truth position,. however I belive that by not taking such a position she is reaching more people that would simple dismiss such a decided position and is indeed getting them to think about 9/11 and question it. A german film "THE OTHER AMERICA" documents many psychological aspects of the 911 operation, juxtaposing very interesting footage of the scale of the crime at Ground Zero. It is entirely in english with german subtitles. It was first broadcast on 07 September 2002 on German-French people-owned TV channel ARTE. If you haven't seen it, helicopter views of the circular hole in WTC5, footage of bent box columns, hosing down of trucks, loading of metal scrap on barges ... a stunning watch. The interviewees speak clearly of the crimes of the elites but do not spell out that 9/11 was an inside job. Their statements are therefore hard to refute and make this documentary a MUST SEE for the "average american". WTC Cleanup Done "Too Quickly"
NEW YORK (AP) -- Workers who spent months searching for human remains in the World Trade Center rubble were often at odds with the agency overseeing the cleanup and frequently asked to halt the operation as they recovered body parts. As the work was wrapping up in 2002, several officials handling the recovery warned that things were moving too fast. They believed more pieces of the lost 2,749 victims could be found, but they were overruled, two of those officials told The Associated Press this week. The officials gave the account after a utility crew accidentally discovered body parts last week in an abandoned manhole along the western edge of the site, and forensic experts have since dug down and found more than 100 bones and fragments from skulls, ribs, arms, legs, feet and hands. "I knew that this was going to happen -- they really just wanted us out of there," said retired Police Lt. John McArdle, the New York Police Department's ground zero commander. "There was not a good exit strategy for some of these places, and if there was, it was poorly done." The project finished months ahead of city officials' yearlong prediction, and cost about $750 million -- just a fraction of the initial multibillion-dollar estimate. A physicist's lucid PopMech debunk..
"As the fires blazed and the temperatures rose within the buildings, NIST (National Institute of Standards and Technology) believes, the remaining core columns (those not severed by the planes during impact) softened and buckled, transferring most of the load to the building's outer structural columns. The floors . . . began to sag from the heat, pulling those columns inward and adding to the burden on the outer columns." Debunking: For anyone who as actually watched the WTC video's carefully, you will note that the south tower was struck near the corner, almost insuring it sustained NO damage to the central core columns. It also had by far the largest fireball produced, indicating a substantially larger portion of the fuel was burned in the initial impact and for the most part outside the building. Oddly, it was the south tower which fell first after burning for only 55 minutes, and at a point when the fires had greatly diminished. In addition, as given by Kevin Ryan who was responsible for the thermal testing of the WTC Steel when it was certified, the samples tested for the WTC were certified to withstand a temperature of 2,000 deg for 6 hours without failing their rated load characteristics. And that is without insulation. The WTC beams were insulated. Jet fuel burns at only 1200-1300 degrees with an ideal oxygen mixture, something not indicated by the black smoke that issued from the fires. There was nothing contained within the buildings that could have raised this figure, and those that use the example of ancient furnaces that tempered steel as a argument, again, do not understand the principles involved. I suggest that if you want the truth, and wish to actually act like a journalist for a change, you broach this subject with a real expert, Mr. Ryan. I can put you in touch with him upon request. Note: This article is in fact over 4 years old, since it has already been posted it will still be listed, sorry for the confusion. There is no indication that any of the fires in the World Trade Center buildings were hot enough to melt the steel framework. Jonathan Barnett, professor of fire protection engineering, has repeatedly reminded the public that steel--which has a melting point of 2,800 degrees Fahrenheit--may weaken and bend, but does not melt during an ordinary office fire. Yet metallurgical studies on WTC steel brought back to WPI reveal that a novel phenomenon--called a eutectic reaction--occurred at the surface, causing intergranular melting capable of turning a solid steel girder into Swiss cheese. Materials science professors Ronald R. Biederman and Richard D. Sisson Jr. confirmed the presence of eutectic formations by examining steel samples under optical and scanning electron microscopes. A preliminary report was published in JOM, the journal of the Minerals, Metals & Materials Society. A more detailed analysis comprises Appendix C of the FEMA report. The New York Times called these findings "perhaps the deepest mystery uncovered in the investigation." The significance of the work on a sample from Building 7 and a structural column from one of the twin towers becomes apparent only when one sees these heavy chunks of damaged metal. A eutectic compound is a mixture of two or more substances that melts at the lowest temperature of any mixture of its components. Blacksmiths took advantage of this property by welding over fires of sulfur-rich charcoal, which lowers the melting point of iron. In the World Trade Center fire, the presence of oxygen, sulfur and heat caused iron oxide and iron sulfide to form at the surface of structural steel members. This liquid slag corroded through intergranular channels into the body of the metal, causing severe erosion and a loss of structural integrity. "The important questions," says Biederman, "are how much sulfur do you need, and where did it come from? The answer could be as simple--and this is scary- as acid rain."